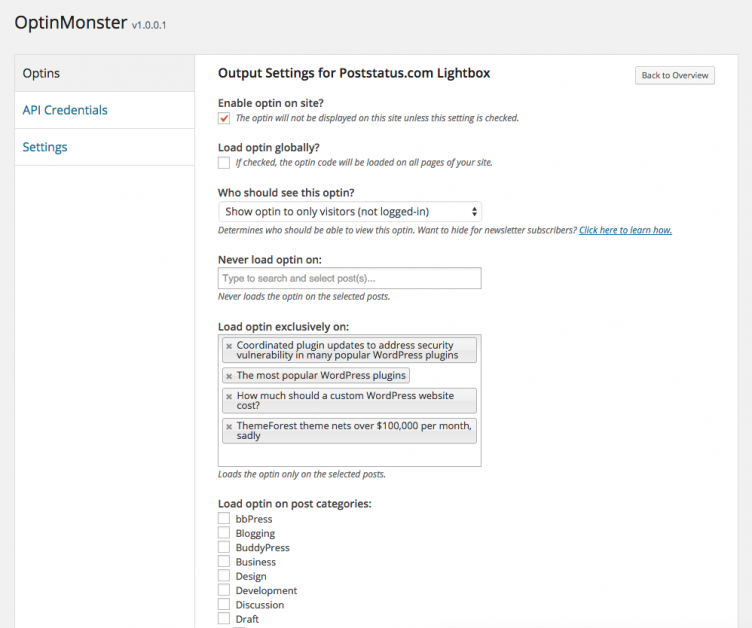 OptinMonster has changed the very core of their product today, and it is now a standalone SaaS (software as a service) product, versus a plugin that runs on users’ servers. OptinMonster is now a stand-alone (SaaS) lead generation software that can be used on any website platform: WordPress, Drupal, Joomla, Shopify, Magento, BigCommerce, and basically any HTML website. In the announcement, Syed Balkhi notes that the commercial-only product has “tens of thousands” of customers. Due to varying server configurations and environments, they ran into a lot of limitations for what they could do with OptinMonster from a a variety of angles. 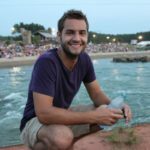 Each WordPress site is hosted in a different environment which proved to be a huge challenge for us since the very early days (shared hosting usage restrictions, plugin and theme conflicts, integration problems on slower hosts, scalability issues on larger sites, lack of a clear upgrade path, etc). These restrictions started limiting us from offering you, our valuable customers, a truly amazing experience and the most powerful lead generation software. OptinMonster is still priced yearly, starting at $49, but since it’s now a hosted solution, they now offer a monthly version as well that starts at only $9. This is one of the first instances I’ve seen of a monthly pricing option for a WordPress product; there are a number of reasons why monthly pricing is daunting for a downloadable product. 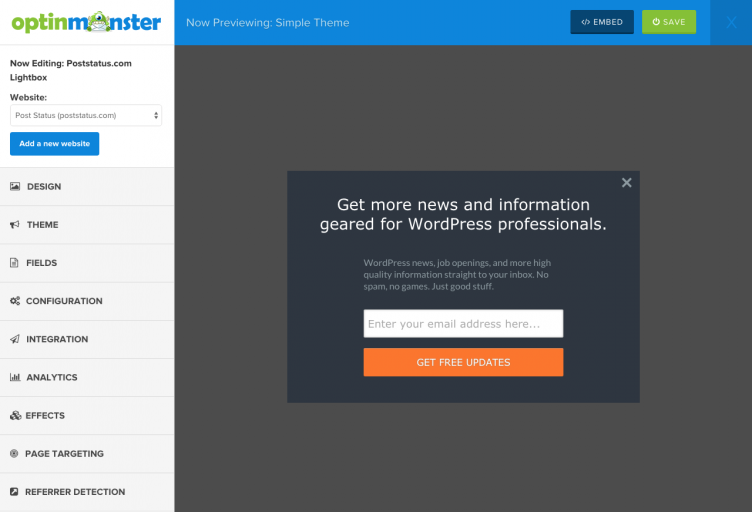 As I noted when OptinMonster launched, I’m very skeptical of popups even if they do work. 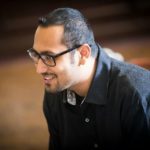 However, Syed and his co-founder Thomas Griffin have slowly won me over that in the right places, well-coded popups and other opt-in tools can play a legitimate role. I’ve been using the hosted version of OptinMonster of four old posts on Post Status for a few days, and I’ve been testing it for a couple of weeks on top of that. I am really impressed with the ways to specify when and where a popup shows up. You can limit opt-ins appearing by referrer URL (like make it only visible on search, or from a particular link from another site, or other domain), by specific taxonomies, exact post URLs, and other metrics. The image above is from the WordPress plugin and has WordPress specific options. I also proposed (and hope it gets included) for them to make it possible to only show opt-ins on posts of a certain age (like published more than 30 days ago). The in-app optin customizer has a separate view that’s more agnostic to WordPress. That view is where you manage a variety of fields, the optin theme, and do most of the configuration. Additionally, OptinMonster has some pretty nice A/B testing for comparing opt-in text and other metrics. And statistics with conversion calculations are available in the OptinMonster dashboard any time. Running on four posts, I’ve shown my opt-in to about 1,000 visitors with just under a 1% conversion rate over the last few days; granted my pitch is awful right now, so that number should be at least 2-3x higher. Those are likely non-regular readers and they only see the opt-ins after a significant period of time on the page or upon exit. I don’t think I’m punishing any regular readers with such a pitch, and it’s a great way to grow my subscriptions. Stats are visible in the dashboard and they also have an easy to use tool to sync your stats with your Google Analytics account. I also intend to replace my regular below-post newsletter opt-in with OptinMonster, just so I can more easily A/B test and track conversions. Even if you’re against a pop-up on every page like I typically am, they have floating bars, slide-ins, and standard forms that you can easily embed as well. 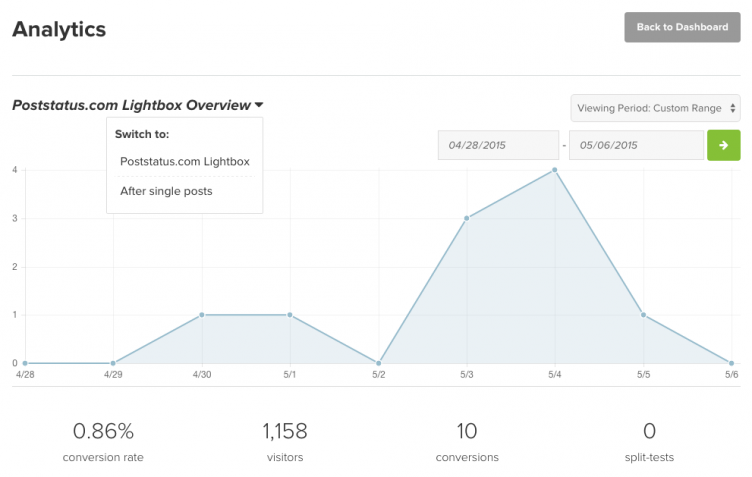 I still don’t think opt-ins are good for every pageview or right when someone shows up on your blog. But I do now think they have their time and their place, and I’ve been very impressed with the work put into this product and new SaaS option. You can learn more about their SaaS launch from the announcement. Just signed up for OptinMonster this past week – very impressed with the service so far and a SaaS offering just makes so much sense for this kind of thing. But since they couldn’t scale it, they reverted to a plugin. Now, they’re going back to SaaS. I’m really curious to see what’s the outcome of this – in terms of speed and customizability for users, and scalability for their network of sites (once it grows over the 50-60 thousand mark). P.S. I’ve been using the plugin for 2 years now and it’s pretty neat overall. Thanks for the writeup Brian. We’re truly excited to see you using OptinMonster on your site. Good luck in the cloud, Syed! It really is a whole new world of possibilities for improved services for users, even if some don’t see it that way at first.